A Glade Sunset. January 18, 2009. The picture above, which can be enlarged by clicking on it, was taken from my favorite point on the Druid Hills golf course for viewing the setting sun. I got there a little later than I had planned, and the sun had already dropped below the ridge line. I was a little disappointed, but stayed to get a few shots of the sky. As it got darker , the light reflecting off the clouds got redder and redder until I got the rose color in the picture above. I’m sorry that the picture is a little dark, but I didn’t want to try any editing. What you see is what came out of the camera. To see more beautiful sky pictures from around the world, or to join in the fun and post your own picture on Skywatch Friday, click HERE. This entry was posted on January 29, 2009 at 9:17 pm and is filed under Glade. You can follow any responses to this entry through the RSS 2.0 feed. You can leave a response, or trackback from your own site. It is gorgeous just the way it is. I don’t ever edit anything. My favorite photos are those that came straight from the camera. This one’s a beauty! Thanks for sharing. The picture may be dark, but the red is intense, and the combination is very dramatic. The red was worth waiting for. It’s a lovely shade. Hi.. thanks for dropping by my SWF post, and thanks for always dropping by my blog and commenting there. Anyway, this is a very interesting sky you have. I love red streaks. I think this is the first time I saw a red-colored sky. The sky looks like it is on fire. Nice picture. I think that the layers of colors are beautiful even if it isn’t exactly what you wanted George…Michelle.. I like it without editing – Original! Whoa! I love that bright red. Quite often, it is just after sunset you get beautiful colors in the sky. I’m glad you waited; it’s gorgeous! That is really beautiful. I’ve often missed a good sunset because I didn’t linger around after the sun already crossed the line. Wow, what gorgeous colors you captured in your photograph. So beautiful! Happy SkyWatch Friday. Stunning colors to say the least, great pic. It was the same scene today morning at my place. I love the volcano ignite effect just before the sunrise. George your photo came out great. It kinda reminds me of lava. =) Hope you have a wonderful day. It doesn’t need any editing ~ it’s beautiful and dramatic already! Wow. George, this is real beauty! That’s beautiful! I prefer honest photos also. Very beautiful George. No need to edit what God has already “painted” so perfectly! I love sunsets–but can’t see them where I live down in the valley. Beautiful fire in the sky! It’s very pretty, George and doesn’t matter that it is dark. That’s just the truth the camera is showing 🙂 I like the last bits of color that come late like that. Must have been a beauty as it went down. Great place to view a sunset. I have so many distractions in my view. There are those pics that dont need any tweaking at all, this is one of them. Happy weekend. The vivid tones and contrasts are lovely. Even in the darkness of the photo the beauty is obvious. I’m always finding myself missing sunsets … sometimes the colors cooperate and hang around … other times they don’t. There was a fire in the Everglades, and that day had the most brilliant red sunset … but I missed it, atleast to photograph it. It was gone by the time I got to my favorite spot. 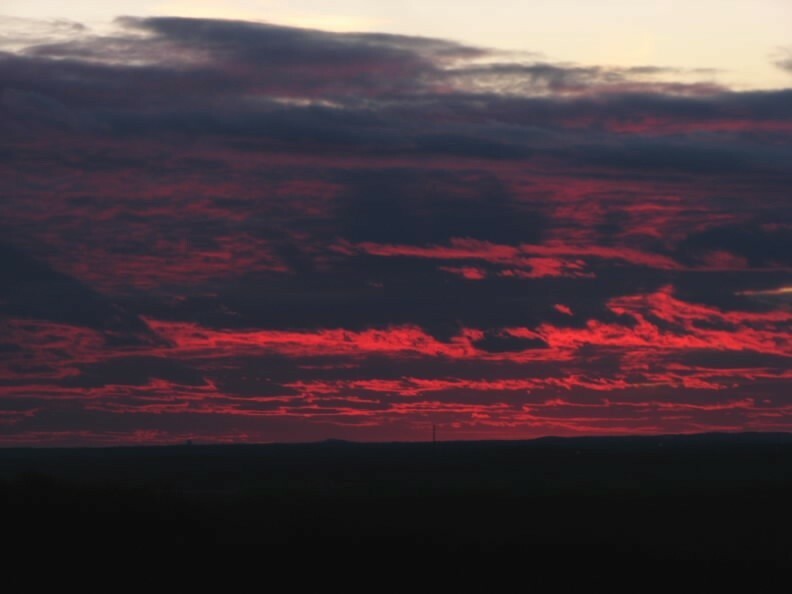 Wow…”red sky at night, sailor’s delight. What a simply beautiful photograph ! That was really a pretty sky! Breathtaking is the only word I can think of! What a wonderful shot! Red at night sailor’s delight! That’s what my Grandpa used to say and my Dad. Colors are really beautiful. My opinion is that this photo is better than “manipulated” by photoshop or PaintShopPro. So the original photo is original and it reflex the situation as it was when You photogrphed the sky. Thank You sharing this photo with us. This image I like. Such mysterious and dramatic sky and the colours are nearly like a bad omen. With that I mean that this would be fitting in a psychological thriller or something similar. Great shot George. I also read your post on retirement. I could retire today and not have any problems getting time to go. Even in the winter without my gardening. George: Beautiful capture in red. What a FIREY sky … dramatically threatening! I understand about getting there just a bit late … it happens to me all too often. I’ve not spent much time at the computer the last 4 days or so, but I did participate in Sky Watch at Happily Retired Gal and Sacred Ruminations on Friday. I’m doing what I can to catch up this afternoon after being away from home all day yesterday and watching the 5-set Men’s Championship Tennis Match earlier this morning. I am glad you waited for the sky to become this dark. I love that intense pink shade!! Wow, what a sky! That’s some fiery color in those clouds.